Someone recently commented that I could rename this space, “The Adventures of Knitting Sarah” and really that’s not a half-bad idea. While I primarily write about knitting and spinning and fiber arts, I also fill this space with my adventures. Adventure for me is usually pretty small scale. I mean, I really do love the macro lens on a camera and there’s a reason — I find the simple things in this world most extraordinary. A salamander in the woods. The call of a northern saw-whet owl on a country road. The toads I find in my backyard. It makes sense. Why else would I be endlessly fascinated by adding twist to fluff to make string which I then knit with two sticks into stuff I can wear? This week’s adventure was on a slightly grander scale than usual. As many of you know, my son loves to go fishing. 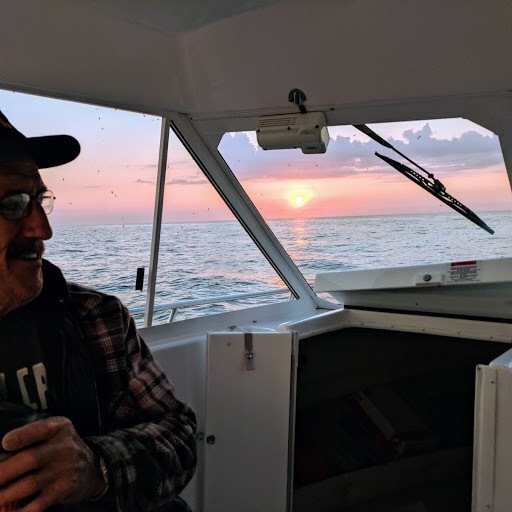 He turned 12 last week and for his birthday my parents treated him (and me and Mr Knitting Sarah) to a chartered fishing trip with my dad out onto Lake Michigan. 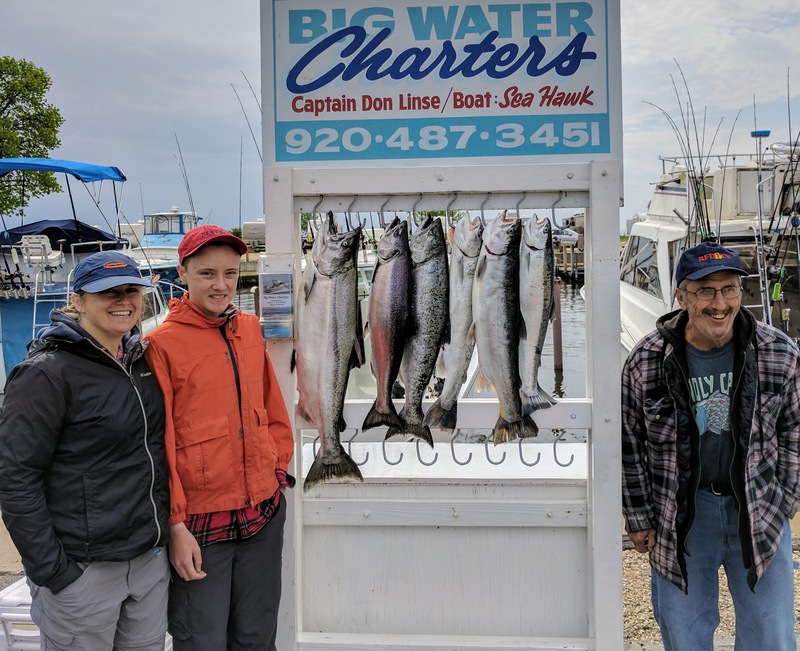 We went with a charter that my dad had used in the past, Big Water Charters out of Algoma and I’d highly recommend them to anyone looking for some Lake Michigan fishing. For us, Algoma is close enough to my parents’ house that we can make the 3:30am departure with only a 2am wake-up call. My husband likes to tease that I’m not really a morning person or a night owl, but more of a middle of the day kind of person so I totally wowed everyone with my speedy and good-natured roll out that morning. I was kind of excited and nervous at the same time. Excited because I like fishing, too, and I love the big water, but nervous because I knew the weather was going to be touch and go. The Captain gave us the option to delay our trip until we had better conditions, but it was the only day we could all be there. So we went and we were at the dock by about 3:15 though and ready to go. The weather started out decently. It was a little “lumpy” as they say and as we sped out to the fishing spot my son was kind white-knuckling his seat. He’s never really been on this kind of boat and I think especially at 3:30, in the dark it was a little intimidating. The lines were in the water before the sun was even touching the tops of the clouds. “Red sky at night, sailor’s delight. Well, it’s true and accurate. This is my husband and son reeling in a salmon in the pounding rain. 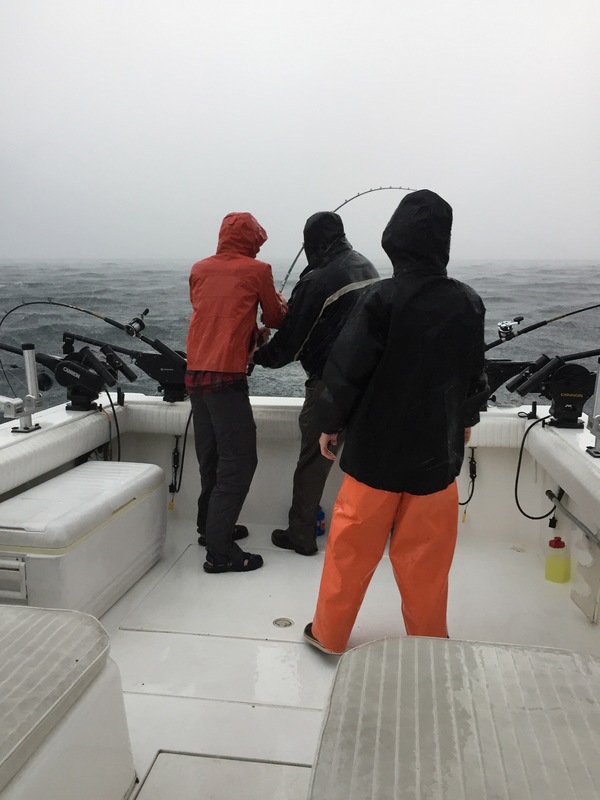 We fished through three rounds of rain and thunderstorms, in varying degrees on lumpy seas. 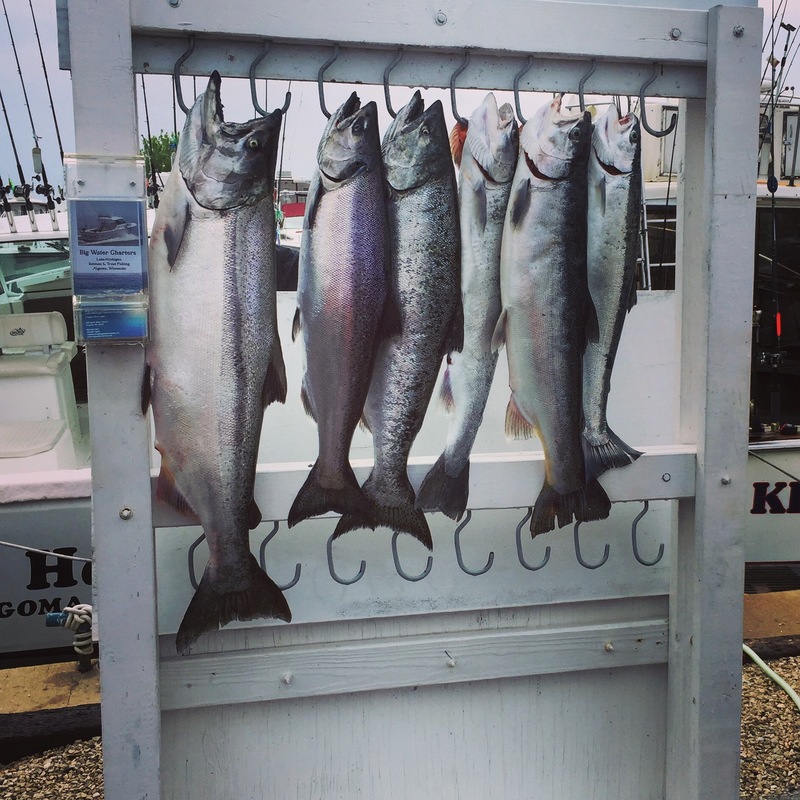 It wasn’t smooth and easy fishing and the weather definitely dampened the willingness of the fish to bite, but at the end of the morning we rode back to the dock with a half dozen awesome fish in the cooler. And that’s when the skies cleared and sun came out. What an experience though, what memories we made! My son got to reel in the most fish (of course), and my dad took one, and I took two. My hubby helped my son and I get the tension on the rod correct. It was especially helpful with the MASSIVE fish on the far left. That was mine and it weighed in at 19.11lbs. For those wondering, no, I never plan to let anyone ever forget this MASSIVE fish. 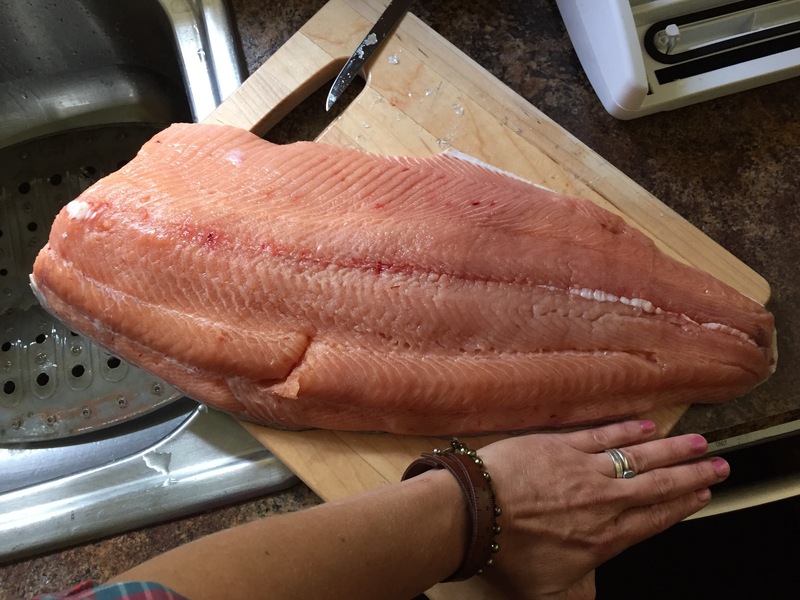 I mean… this is the fillet that came from it with my hand for scale. The charter took care of all the cleaning and when we got back to my parents’ house my mom and I got them all vacuum sealed and into the freezer. 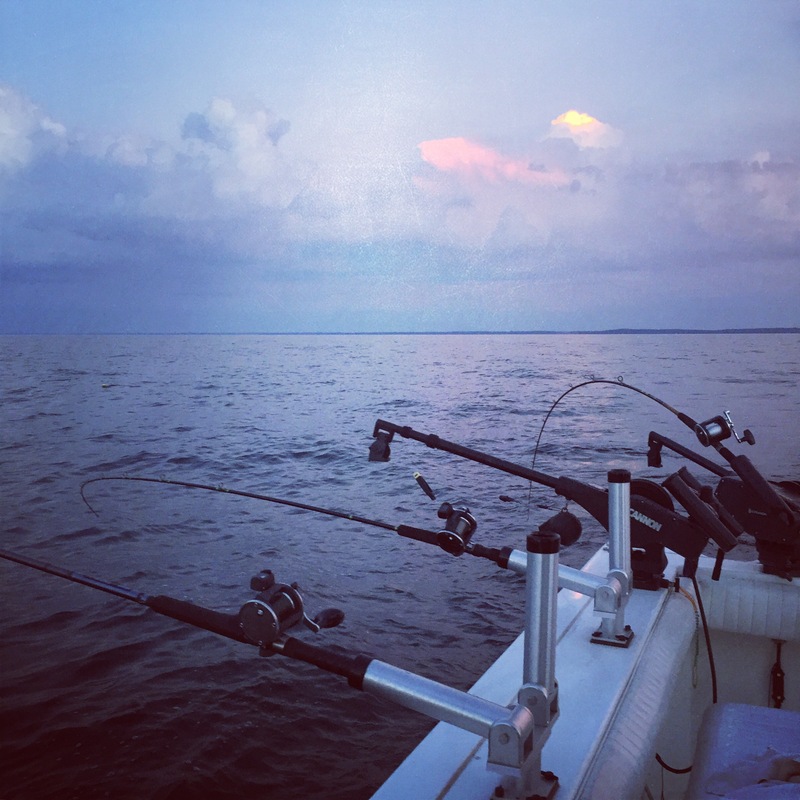 All in all, we’re thinking we got maybe about 35lbs of hard-won fish to feast upon. Maybe a little more or less — I didn’t bother to weigh it. I didn’t knit a stitch while fishing and only got in a few rounds of a super secret project after the fish was in the freezer and my parents’ lawn was mowed. What can I say? Some days the adventures of Knitting Sarah just don’t involve knitting or spinning or fiber arts at all. And sometimes they don’t require a macro lens, but instead are measured in slightly grander scales. What a great trip for your sons birthday, it’s something he will always remember, bad weather and all. The salmon filet looks yummy! Agreed! I’m so thankful my dad wanted to go. It was definitely a trip to remember! WOW! Those are some awesome fish and the one you landed is a monster. What a fun time, bad weather or not. I love your adventures! It was REALLY fun. I’m definitely hoping to do it again sometime! One of the things I love about your blog is that your “adventures” celebrate the little things and the beauty of daily life. This beauty is all around us…all we have to do is look…and you do. The fishing trip was such a precious gift for all of you! There is nothing better than making memories like that! I’m so glad to hear it because I really like putting the fiber arts in the context of everyday life. I think it’s important to remember it’s part of a bigger picture. And I never, ever will let them forget! What an awesome experience for your son and the whole family!